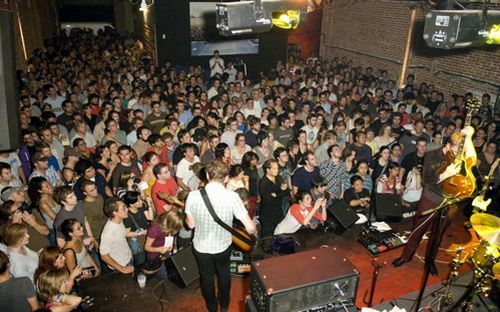 Spoon brought the heat last night to their “secret” show at the Little Radio warehouse in downtown Los Angeles. Literally. Two steps inside the brick-walled building, and the temperature rose a good 25 degrees. Nevertheless, the at capacity crowd swilled Dewars and listened to special guest, John Vanderslice, perform material off his upcoming album Emerald City. +++++++ By the time Spoon took the stage the walls were sweating with Texas humidity by band proxy. Playing a good hour and half, the audience were treated to a full dose of their latest, Ga Ga Ga Ga Ga, plus a generous amount of crowd favorites/pleasers. A damn fine rock & roll band. This one-off has only heightened our anticipation for the bands next L.A. show, this Fall (Sept 10th), at the Henry Fonda. Someday they’ll make shirts that fit right.